This article is about the ice cream dessert. For the Korean sausage, see Sundae (sausage). "Ice Cream Sundae" redirects here. For other uses, see Ice Cream Sundae (disambiguation). Not to be confused with Sunday. The sundae ( /ˈsʌndeɪ, ˈsʌndi/) is an ice cream dessert. It typically consists of one or more scoops of ice cream topped with sauce or syrup, and in some cases other toppings including sprinkles, whipped cream, marshmallows, peanuts, maraschino cherries, or other fruits (e.g., bananas and pineapple in a banana split.). According to the Oxford English Dictionary, the origin of the term sundae is obscure; however, it is generally accepted that the spelling. Among the many stories about the invention of the sundae, a frequent theme is that the ice cream sundae was a variation of the popular ice cream soda. According to documentation published by the Evanston Public Library (Illinois), the drinking of soda was outlawed on Sundays in Illinois. Other origin stories for the sundae focus on the novelty or inventiveness of the treat or the name of the originator, and make no mention of legal pressures. Various localities have claimed to be the birthplace of the ice cream sundae, including Plainfield, Illinois; New Orleans, Louisiana; Cleveland, Ohio; and New York City. Two Rivers' claim is based on the story of George Hallauer asking Edward C. Berners, the owner of Berners' Soda Fountain, to drizzle chocolate syrup over ice cream in 1881. Berners eventually did and wound up selling the treat for a nickel, originally only on Sundays, but later every day. According to this story, the spelling changed when a glass salesman ordered canoe-shaped dishes. When Berners died in 1939, the Chicago Tribune headlined his obituary "Man Who Made First Ice Cream Sundae Is Dead". Two Ithaca High School students, however, claim that Berners would have only been 16 or 17 in 1881, so it is therefore "improbable" that he would have owned an ice cream shop in that year. They also state that the obituary dates Berners' first sundae to 1899 rather than 1881. Residents of Two Rivers have contested the claims of other cities to the right to claim the title "birthplace of the ice cream sundae". When Ithaca, New York, mayor Carolyn K. Peterson proclaimed a day to celebrate her city as the birthplace of the sundae, she received postcards from Two Rivers' citizens reiterating that town's claim. Buffalo's Stoddart Bros. Drug Store advertised serving up ice cream sodas garnished with fruit syrup and whipped cream in the pages of The Buffalo Evening News and the Buffalo Courier, as early as 1889. Evanston was one of the first locations to pass a blue law against selling ice cream sodas in 1890. "Some ingenious confectioners and drug store operators [in Evanston]... obeying the law, served ice cream with the syrup of your choice without the soda [on Sundays]. Thereby complying with the law… This sodaless soda was the Sunday soda." As sales of the dessert continued on Mondays, local Methodist leaders then objected to naming the dish after the Sabbath, so the spelling of the name was changed to sundae. Supporting Ithaca's claim to be "the birthplace of the ice cream sundae", researchers at The History Center in Tompkins County, New York, provide an account of how the sundae came to be: On Sunday, April 3, 1892, in Ithaca, John M. Scott, a Unitarian Church minister, and Chester Platt, co-owner of Platt & Colt Pharmacy, created the first historically documented sundae. [dead link] Platt covered dishes of ice cream with cherry syrup and candied cherries on a whim. The men named the dish "Cherry Sunday" in honor of the day it was created. The oldest-known written evidence of a sundae is Platt & Colt's newspaper ad for a "Cherry Sunday" placed in the Ithaca Daily Journal on April 5, 1892. By May 1892, the Platt & Colt soda fountain also served "Strawberry Sundays" and later, "Chocolate Sundays". Platt & Colt's "Sundays" grew so popular that by 1894, Chester Platt attempted to trademark the term ice cream "Sunday". Plainfield, Illinois has also claimed to be the home of the very first ice cream sundae. A local belief is that a Plainfield druggist named Mr. Sonntag created the dish "after the urgings of patrons to serve something different." He named it the "sonntag" after himself, and since Sonntag means Sunday in German, the name was translated to Sunday, and later was spelled sundae. Charles Sonntag established himself as a pharmacist after graduating from pharmacy school in 1890. He worked for several years under the employ of two local druggists, Dr. David W. Jump and F. R. Tobias. Sonntag established his own pharmacy (as early as 1893 and no later than 1895) in a building constructed in the months following a December 1891 fire that devastated one side of the town's business district. His store advertised "Sonntag's Famous Soda" and was, likely, the first soda fountain in the Village of Plainfield. The original sundae consists of vanilla ice cream topped with whipped cream and a maraschino cherry. The original sundae consists of vanilla ice cream topped with a flavored sauce or syrup, whipped cream, and a maraschino cherry. Classic sundaes are typically named after flavored syrup employed in the recipe: cherry sundae, chocolate sundae, strawberry sundae, raspberry sundae, etc. The classic sundae is traditionally served in a tulip-shaped, footed glass vase. Due to the long association between the shape of the glass and the dessert, this style of serving dish is generally now known as a sundae glass. This dessert consists of two halves of a banana, sliced lengthwise. The classic banana split consists of strawberry ice cream topped with chocolate syrup, chocolate ice cream topped with crushed pineapple, and vanilla ice cream topped with strawberry syrup. Each scoop is individually garnished with whipped cream and a maraschino cherry. This is a sundae served in a tall glass filled with layers of ice cream or yogurt, gelatine, and flavorings such as syrups, whipped cream, granola, fresh fruit, and/or liqueurs. This ice cream sundae is served in a large tall glass, consisting of layers of ice cream, jelly, and cream, topped with syrup, nuts, whipped cream, and often a cherry; it is popular in the United Kingdom. Sliced or chopped fruit that has been sugared and let to sit for an hour or more to form a sweet syrup may be substituted for the flavored sauce or syrup of the classic sundae. Fresh fruit sundaes include named variations such as the strawberry, peach, raspberry, blueberry, blackberry, and mixed fruit sundaes. Fresh fruit sundaes are generally served during the summer months, and they are sometimes advertised as specialty offerings in agricultural areas where particular fruits are grown. Jarred fruit products are also available which are made specifically for the preparation of ice cream sundaes, often sweetened and in a thickened flavored juice. Sundaes can also be topped with canned fruits. Heated-sauce sundaes are those in which the flavored sauce or syrup is heated before being poured over the ice cream, creating appealing differences in temperature as well as texture. The hot fudge sundae is a variation on the classic sundae and is often a creation of vanilla ice cream, sprinkles, hot chocolate sauce (hence the "hot fudge"), whipped cream, nuts, and a single bright-red maraschino cherry on top. The invention of this particular variant has been credited to Clarence Clifton Brown, the owner of C.C. Brown’s Ice Cream Shop in Hollywood, California, in 1906. Clifton made his own fudge in copper kettles that were originally brought to the city by covered wagon, using a secret recipe that the family guarded; the store continued to prepare the fudge in these same barrels until the store's closure in 1996. It is said to have taken him two months to perfect the complete sundae. The double fudge sundae is like a regular hot fudge sundae, except that it is twice as big and is served in a glass banana split dish or boat. It is made from the same ingredients as a regular hot fudge sundae, but also includes extra fudge, as well as whipped cream, optional nuts or sprinkles, and a maraschino cherry on top. This is a variation of the hot fudge sundae in which heated caramel sauce replaces the heated chocolate sauce. The other ingredients remain unchanged. The combination of vanilla ice cream, hot fudge and hot caramel sauces, and toasted pecans is known as a turtle sundae. The name derives from the turtle candy, which consists of pecans covered with caramel and then dipped in chocolate. The butterscotch sundae is a variation of the hot fudge sundae. This is a variation of the hot fudge sundae in which butterscotch sauce replaces the heated chocolate sauce. The other ingredients remain unchanged. Occasionally, other stiff-textured sweet sauces replace the hot chocolate sauce of the classic hot fudge sundae. These novelty sundaes include the peanut butter sundae, the Nutella sundae, the hot maple syrup sundae, and others. This sundae features a scoop of vanilla ice cream with chocolate sauce and a scoop of chocolate ice cream with creamy white marshmallow sauce, topped with Spanish peanuts. The Tin Roof Sundae was created in 1916, at the Potter Drug Co., in Potter, Nebraska, owned by pharmacist James Earl Thayer. His son, Harold Dean “Pinky” Thayer, worked in the soda fountain as a teenager, and is credited for inventing the ice cream treat. According to Dr. J.E. Thayer of Sidney, there are two stories of how the sundae got its name. The first is that it was inspired by the tin ceiling in the business; the other is that the stable across the street had a tin roof and that he named it after that. The Tin Roof Sundae can still be enjoyed in Potter, Nebraska, where the Potter Drug Co., now called the Potter Sundry, is still in operation. This is a rich sundae made with brownies, vanilla ice cream, chocolate syrup, peanuts, hot fudge, and whipped cream, often topped with maraschino cherry. If a blondie replaces the brownie, then caramel sauce is used as a topping instead of chocolate sauce. This sundae consists of vanilla ice cream, crushed strawberry, crushed pineapple, whipped cream, and a cherry. It is named for the protagonist in the 1899 book David Harum; A Story of American Life. ^ "sundae (n.)". Online Etymology Dictionary. Retrieved 2018-05-26. ^ The Ice Cream Trade Journal. The National Association of Ice Cream Manufacturers. July 1909. p. Vol 5, No. 7. Retrieved 20 August 2013. ^ "Man Who Made First Ice Cream Sundae Is Dead". Chicago Daily Tribune. July 2, 1939. p. 1. ^ "Two Rivers - The Real Birthplace of the Ice Cream Sundae". Two Rivers Economic Development. Archived from the original on 1 May 2005. Retrieved 2007-06-26. The ice cream sundae story dates back to 1881 when chocolate sauce was used to make ice cream sodas at Ed Berners' soda fountain at 1404 15th Street. 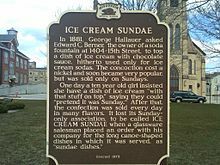 One day, a vacationing George Hallauer - a Two Rivers native then living in Illinois - asked Berners to put some of the chocolate sauce over a dish of ice cream. According to a 1929 interview with Berners, he apparently didn't think it was a good idea. ^ a b c "Documenting Ithaca New York as the Home of the Ice Cream Sundae". Ithaca Convention & Visitors Bureau. 2007. Retrieved 2007-08-20. On Sunday afternoon, April 3, 1892, after services at the Unitarian Church, Reverend John M. Scott paid his usual visit to the Platt & Colt Pharmacy in downtown Ithaca. Shop proprietor, Chester C. Platt, was church treasurer and he met often with Scott for conversation after services. Seeking refreshment for himself and the reverend, Platt asked his fountain clerk, DeForest Christiance, for two bowls of ice cream. But instead of serving the reverend plain vanilla, Platt took the bowls and topped each with cherry syrup and a candied cherry. The finished dish looked delightful and tasted delicious—so much so that the men felt obliged to name the new creation. After some debate, Scott suggested that it be named for the day it was created. Platt concurred and the first "Cherry Sunday" was born. ^ Laura Zaichkin (June 30, 2006). "Sundae wars continue between Ithaca and Two Rivers". Ithaca Journal. ^ Steve Cichon (Dec 13, 2016). "Is Buffalo the home of the ice cream sundae?". The Buffalo News. ^ "The History of Ice Cream". International Dairy Foods Association. 2013. Retrieved 3 July 2014. ^ "Ithaca's Gift to the World". Retrieved 2011-11-27. ^ "Village of Plainfield Historical Information Directory". Archived from the original on 2011-01-05. Retrieved 2011-04-03. Plainfield is also claimed to be the home of the very first ice cream sundae. Story says that a Plainfield druggist created the novelty after the urgings of patrons to serve something different. Topping some ice cream with syrup, he named it the "sonntag" after his surname. Sonntag means Sunday in German, thus the ice cream sundae was born. ^ a b Pool, Bob (7 June 1996). "The Final Scoop : Saturday's Hot Fudge Sundaes Will Be the Last at C.C. Brown's, Closing After 90 Years as an L.A. Landmark". Los Angeles Times. Retrieved 7 February 2019. ^ a b Smith, Emily (25 July 2012). "National hot fudge sundae day". Eatocracy. CNN. Archived from the original on 30 July 2012. Retrieved 7 February 2019. ^ Editor, ROGER HOLSINGER, Assistant. "The Tin Roof: Potter Sundry famous for yummy creation". starherald.com. Retrieved 2017-06-29. ^ Knight Seccaspina, Linda. "What Was the David Harum Ice Cream Sundae Sold in Lanark County?". lindaseccaspina. Retrieved 1 January 2019. Wikimedia Commons has media related to Sundaes and ice cream parfaits. The Ice Cream Sundae’s Birthplace? That’s the 64,000-Calorie Question New York Times. 6 August 2006.